PHOENIX (AP) — Authorities in Arizona were checking out another possible shooting Thursday on a freeway in the Phoenix area, where electronic billboards flash a “shooting tips” hotline to drivers. Some residents just take city streets, fearing a spate of shootings that has unnerved residents across the nation’s sixth-largest city. The state Department of Public Safety said a passenger car’s window was damaged when hit by an unspecified projectile. It’s unclear if the incident involved a shooting, DPS spokesman Bart Graves said. Video aired by KNXV-TV showed an intact but severely cracked rear window with a visible indention. Also Thursday morning, a motorist reported a gunshot on I-10 several miles to the west, but Graves said there was no damage or injury so the report was unconfirmed. A total of 10 “shooting incidents” were reported through Wednesday, with the first occurring Aug. 29, according to the DPS. 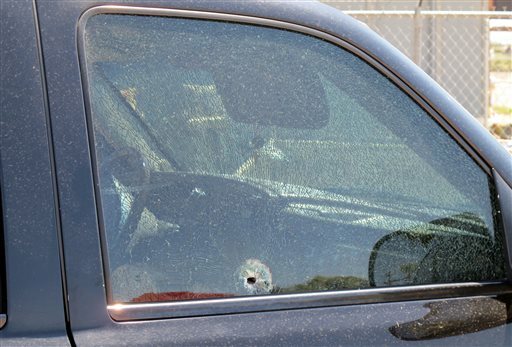 Most were on I-10 and seven of the 10 involved bullets, with three others involving unspecified projectiles, the agency said. Most have been along I-10 in the heart of the city. No one has been seriously hurt, although one bullet shattered a windshield and broken glass cut a 13-year-old girl. His agency brought in the FBI, the Bureau of Alcohol, Tobacco and Firearms and local police to help. Authorities were conducting surveillance and deploying undercover detectives and members of the SWAT team and a gang task force. Juan Campana works at an appliance business near where many of the shootings occurred. He was surprised to look up and see helicopters over the scene of Wednesday’s shooting. Campana said he’s not taking the freeway anymore. “I go through the streets when I go home,” he said. Police have been asking for the public’s help in identifying a suspect, including putting messages on freeway billboards urging people to report suspicious activity. They quadrupled the reward Tuesday to $20,000. Graves said officials would not discuss the surveillance or other aspects of its investigation. Police do not know if all of the shootings are connected or whether a copycat might be at work. Investigators don’t know a possible motive for the shootings, Graves said. The shootings brought back memories of other random highway and roadside shootings that have occurred around the country over the past decade, most notably the sniper attacks that terrorized the nation’s capital more than a decade ago. In other cases, a man was convicted last year of terrorism charges after opening fire on a busy Michigan highway because he believed the drivers were part of a government conspiracy against him. An Ohio man took shots at several cars and houses over several months in 2003, killing one, before being caught and sent to prison. Law enforcement officials who helped crack the cases in Ohio and Michigan described the difficult task of nabbing a suspect in highway shooting investigations. The efforts require a large number of officers who are ready to flood an area immediately after shots are fired, said Lt. Ron Moore, who commanded a Michigan task force that investigated the 2012 spree in which 23 vehicles were shot on or near Interstate 96. “You have to bring all the resources you can to bear on the problem — and that’s exactly what we did,” said Moore, an officer in Wixom, Michigan.